Eugene Wayne Leard entered Heaven’s gates on Thursday, November 9, 2017 at the age of 91. The son of Albert Wilburn and Ina (Patterson) Leard, Eugene was born on September 26, 1926 in Oklahoma City, Oklahoma. 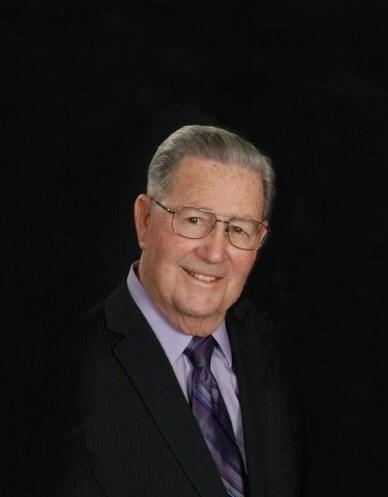 After graduating Central High School, Eugene began working in the automotive supply industry and worked for Save Auto Stores for many years. On May 14, 1945, Eugene married the love of his life, Juanell Gentry in Oklahoma City, Oklahoma. Together they shared more than 72 years of marriage. Eugene had a heart for serving the Lord and others. He served as an Elder at South Woodward Church of Christ. He also enjoyed worshipping and fellowshipping at South Walker Church of Christ for many years where he served as treasurer. Eugene presided as President of the Oklahoma Unit of the Wally Byam Airstream Club. In his spare time, Eugene enjoyed such hobbies as golfing and playing his guitar in Last Chance Band, but most of all, spending time with his family whom he loved so much. He will be remembered for his sense of humor and love for music. A loving husband, devoted father and faithful friend, Eugene will be deeply missed. To send flowers to the family of Eugene Wayne Leard, please visit our Heartfelt Sympathies Store.